Experienced electricians are in serious demand. First year study focuses on residential wiring techniques. 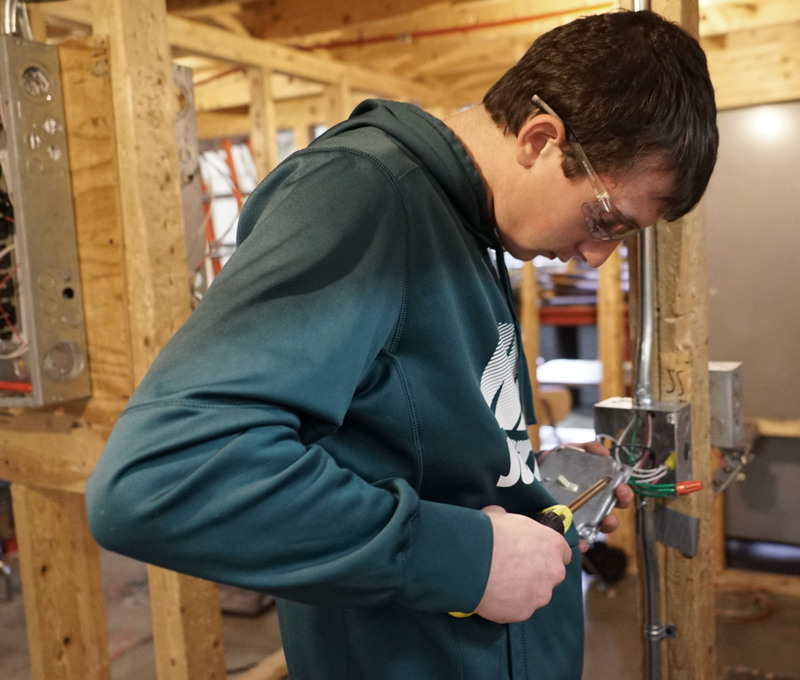 Students will build at least 40 different electrical wiring circuits within the first 10 weeks and also study conduit bending, AC/DC theory and national electrical code. Year two will focus on commercial/industrial maintenance wiring, including installing and repairing conduits, motors, light fixtures and more with the possibility of an internship with a local business. This is a two year program for high school juniors and seniors. Students will have the opportunity to earn up to four credits per year in CTE or a combination of CTE and integrated academic credit for career and financial management and math, and science. Sample units of study include basic safety, introduction to hand tools and power tools, introduction to construction math, blueprint reading and electrical construction drawings, electrical circuits, device boxes, conductors and cables grounding and bonding, circuit breakers, fuses and control systems. Career opportunities include construction, residential/hospital maintenance, motor manufacturing, electrical supply houses, surveillance/security system installation, electrician. We have articulation agreements with Alfred State College, Lincoln Technical Institute, SUNY Delhi, Jefferson Community College, and IBEW Local 910. Students can also earn a 10-hour safety card issued by Occupational Safety and Health Administration (OSHA), as well as the two-year National Center for Construction Education and Research (NCCER) certifications.